Quick summary – this was a long, hot race with a huge field of more than 175 riders. I rode really conservatively never chasing anything down or trying to get into any moves, and this worked out well as I had tons of energy left for the uphill finishing sprint where I finished 8th. With three riders up the road, that means I finished 11th in the race. Congrats to Mat Davis (Team La’Sport) on a strong second place finish. 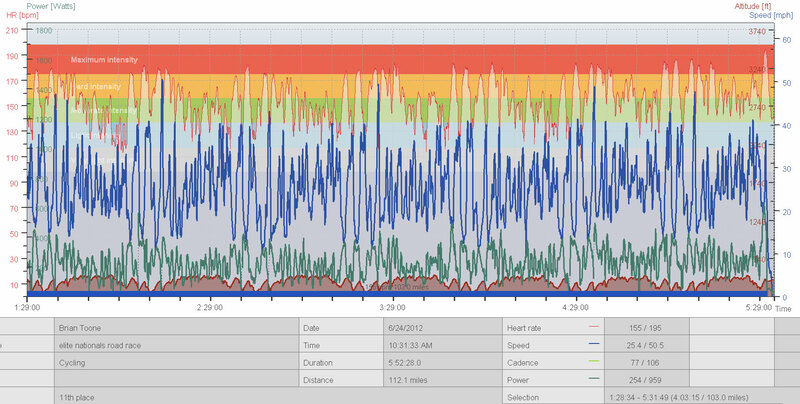 Also, the power map and plot below also summarize the race … hard on the uphills and coasting or braking on all the downhills getting sucked along by the huge field. These Garmin screenshots also summarize the race. The max speeds indicate the “sucking” power that the huge field had. 51mph on a less than 10% downhill! Also, the temperature of 107.1 degF indicates how hot it was in the sun. 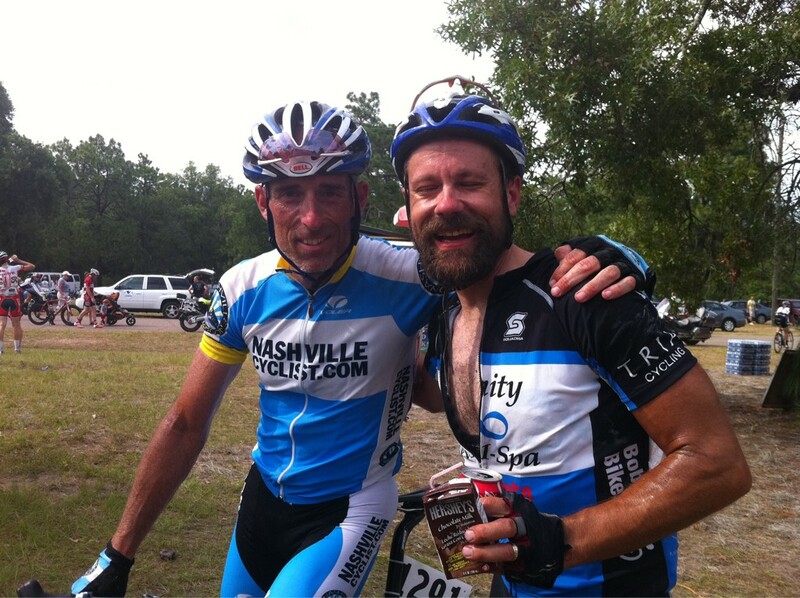 And finally over 8300′ of climbing is a lot of climbing for a race! Kristine and I drove over to Augusta, GA on Saturday for the road race today – leaving the kids home with Grandma and Grandpa. This made for a short, fun getaway trip with Kristine to race on a course that I raced over 15 years ago as a college student at Clemson. The course is on a large, active military base (Fort Gordon), which adds to its uniqueness. “CAUTION: target area”, “The Confidence Course” were two signs that I noticed today, but my favorite from 15 years ago was “WARNING: unexploded ordinance”. I didn’t see that sign today, but I really didn’t have much time to look either as the race was super fast covering 103 miles in just over 4 hours. The course is constantly rolling with no flat sections at all. There are a few longer hills including the finishing hill, but none of them are long enough to be categorized climbs. The air temperature was probably low to mid 90s with lots of humidity, but in the sun it was well over that with my Garmin reading a max of 107.1 degF. I knew that hydration would be important, and so I planned to take a bottle from Kristine and a neutral water bottle every lap. Kristine positioned herself at the front of the feedzone, and did an excellent job handing me five bottles for a total of nine bottles of gatorade, coke, and water consumed during the 4 hour race. I never once felt any muscle tightness (indicative of an oncoming cramp) and was able to sprint at full speed at the end of the race without fear of cramping. Strategically, I raced a conservative race having convinced myself that I should wait until two laps to go to try and get into any kind of move. But with two laps to go, our field was still really large and moving really fast so I didn’t think a break would be able to stick. Many breaks formed during the race but were brought back by the large field’s momentum on the downhills. Funny sidenote – I had ridden to the start from our hotel, so I knew that I would need to do a bit of math to figure out which lap we were on during the race. With two laps to go, I was pretty sure we had two laps to go – but my distance was already up to 85 miles partway through that lap so I had a hard time convincing myself that we really had two full laps left to go. I knew that I had ridden about 8 miles before the start, but in my state of delirium from the heat I couldn’t quite figure out what to do with that 8 miles to confirm that we really had two laps left. Eventually, I got it all worked out and realized that I need to add the 8 miles to expected race distance of 104 miles to get the total that would appear on my Garmin when the race was over. I would guess this took 10 minutes to figure out between thinking about the race and moving around in the pack and then revisiting this relatively simple math problem in my head. Plus, what makes the story even funnier is that I forgot all the math and had the number 113 stuck in my head so that when I saw 109 miles, I figured we had 3 miles left because I subtracted 113 from 109 incorrectly to get 3 miles, which was the correct distance even though the subtraction was wrong. I would imagine that a neuroscientist would be quite interested to see all the craziness going on in my head to make me struggle with these extremely simple math problems during the race. Back to the race – there was one break very early with a chase group behind it that had close to a 2 minute gap on the field. I’m pretty sure that all the major teams were represented, but they couldn’t extend their gap because there would always be somebody attacking from our group causing the whole field to chase. Once the field got up to speed on the rollers – there was no stopping it. We hit close to 50mph just about every lap on the downhill after the feedzone, and I am sure that the breaks were going at least 5mph slower on all the downhills. Our giant field would bunch up on some of the uphills slowing the pace down substantially. But then we would go flying down the next downhill. Plus some of the uphills were short enough that if there was an attack at the front of the group, then those in the back could carry there momentum up the hill without the normal yo-yo effect. This meant that the field was not only flying on the downhills, we were also flying up some of the uphills. Eventually, a strong group of 3 emerged from the largest break (about 19 riders). And this turned out to be the winning break with eventual winner Julian Kyer (Juwi Solar), Mat Davis (Team La’Sport), and Stefano Barberi (Cashcall Mortgage). These three built up a lead of 1’30” with two laps to go while the remnants of the larger break was quickly chased down by the field. The gap continued to fall throughout the last two laps – during which time a chase group of two or three emerged from the field. This chase group stayed away until 1K to go when they were caught during the sprint. The break of three stayed together until the final climb and just barely held off the field – finishing 17, 14 and 6 seconds in front of the field. In the field sprint, I decided that I needed to be on the righthand side of the group going up the final hill – even though the wind was coming from the right because the field was always bunching up on the left. 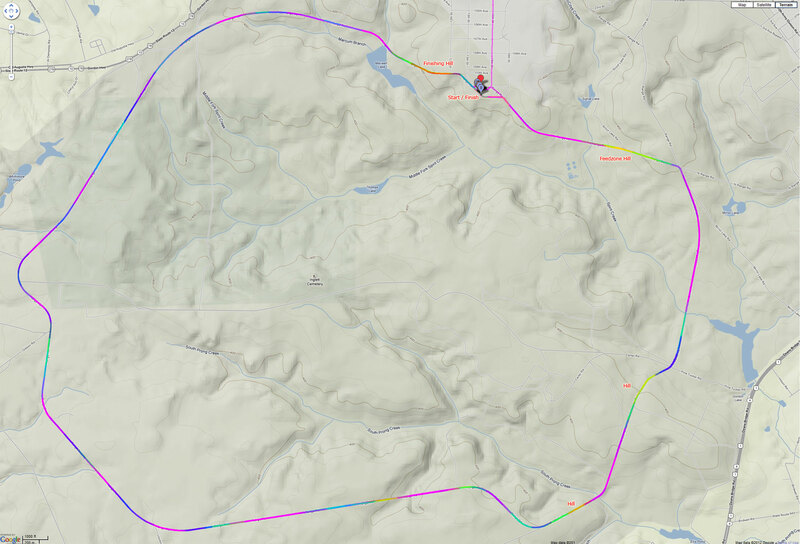 This worked out really well because the field bunched up on the left and I flew around a ton of people (10-20) at the very bottom of the climb. Then I got tucked in behind another rider across the crest of the hill into the slight downhill 200 meters. The road made a quarter-turn into a stiff headwind, though, and as people who had been at the front started to crack, I passed a lot more people to end up 8th in the field sprint, 11th in the race with Julian, Mat, and Stefano already across the line. 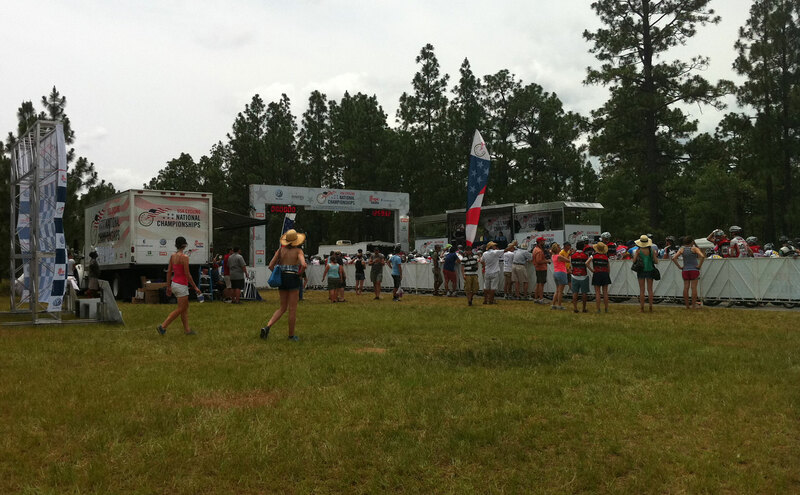 Here is the Start/Finish area just before the start of our race. Note that the huge field extends off the edge of the image! My Garmin was covered in dried sweat after the race. 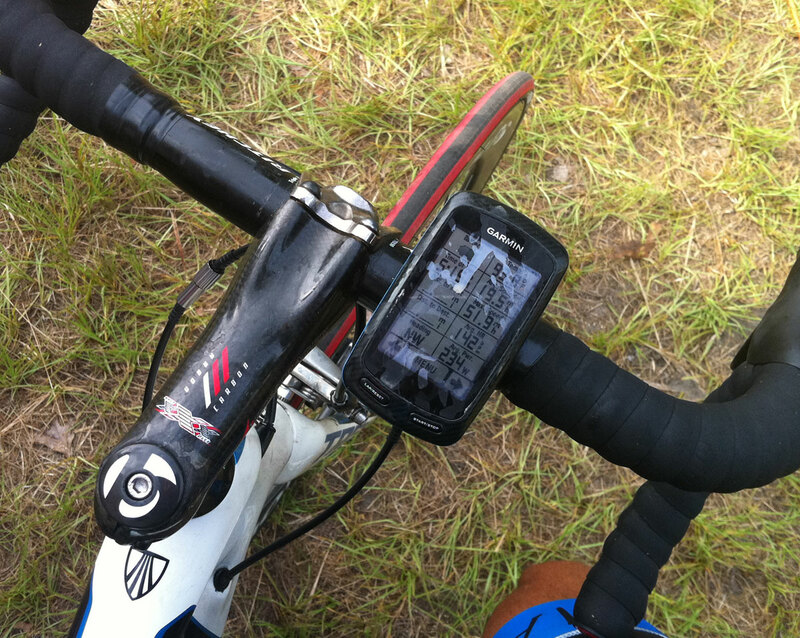 This entry was posted in Racing and tagged hot, road race on June 25, 2012 by kartoone.